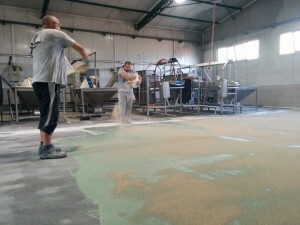 In the epoxy flooring industry one of the most commonly used minerals is quartz sand (also referred to as silica sand). Quartz is a notoriously hard mineral which makes it ideal for industrial floors. However, quartz has many different uses in epoxy floors and this can lead to confusion among clients and contractors on its intended use. I have listed below the key uses of quartz sand in epoxy floors. Keep in mind that sometimes quartz sand can serve multiple purposes. In the article I am referring to quartz sand that can range from very fine silica sand (150 μm) to quartz granules of 2mm. Anti-slip floors are common in pedestrian walkways, manufacturing facilities (exposed to oils and chemicals), car parks, ramps etc. In the picture below we used quartz sand of 0,8-1,2 mm for an olives packaging factory that was exposed to high amounts of oils and brine during operation. Quartz as a filler for self-leveling systems. Quartz sand is commonly added as the ‘third component’ in self levelling flooring systems. Here the purpose of quartz is twofold: By adding quartz the floor screed increases its hardness. Furthermore quartz is used to bulk out the epoxy and to decrease the consumption of epoxy per square meter without forgoing any mechanical properties. In such systems the quartz does not remain visible after application It is mixed together with the epoxy material and the floor should attain a smooth finish. Quartz as a filler for grouting and coving. Large amounts of quartz in the epoxy mix can make the product thick like a grout. It can be used for grouting holes, cracks even constructing rounded coves around the edges of the floor (like in the picture below). Not all epoxy resins are suitable for such a job however. (for example high solvent epoxy systems should not be mixed with quartz) Always ask the manufacturer first. Quartz as decorative component of the floor. In this instance the quartz becomes a key visible component of the decorative aspect of the floor. Coated quartz granules are commonly used for such purposes. They are trowel applied systems and very popular in retail spaces and areas frequented by pedestrians. Quartz as a bonding agent. 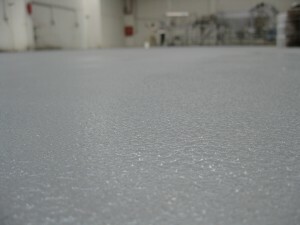 Quartz is a great material to enable inter-coat adhesion and to minimize the risk of delamination. A common procedure is to sprinkle quartz sand on a wet primer (or base coat). This will then help the next layers bond. This method is very useful if several days will pass between the coating of the next layer. You will get better bonding and smoothing of each coat. This method is recommended for thicker floor coats (like self-smoothing epoxies). Have I missed any uses of quartz? What other used of quartz sand do you use quartz in your epoxy floors? Please comment below. If you enjoyed this article, please share it!